Roxanna Hope Radja, Ward Horton, Michael Urie, Harvey Fierstein, Mercedes Ruehl, Jack DiFalco, and Michael Hsu Rosen. Photo Credit: Andrew Eccles. Following an acclaimed Off-Broadway run at Second Stage Theater last fall, a triumphant revival of Harvey Fierstein’s “Torch Song” opened at the Helen Hayes Theatre on Broadway earlier this month. In a feat of synchronistic fate, the Hayes is the same theatre (then named the Little) where Mr. Fierstein’s landmark play (then titled “Torch Song Trilogy”) opened on Broadway in 1982, following an acclaimed Off-Broadway run. 36 years later, the three one act plays that comprise “Torch Song Trilogy”—which premiered separately Off-Off-Broadway at LaMama ETC between 1978 and 1979—are consolidated into two acts, with over an hour of dialogue cut, and graced with a newly abridged title, the pithy “Torch Song”. What blissfully remains intact, though—beside the sterling cast assembled for the Off-Broadway production—is the abundance of heart and humanity at the core of the play. “Torch Song”, which hails from a precious moment of gay life post-liberation (roughly 1969) and pre-AIDS (roughly 1981), finds new resonance in 2018, a precarious moment of gay life witness to lightning-fast social, political, and legal recognition, and its concomitant backlash heightened by increasing polarization and fracturing of American society. The play, an uproarious comedy of the zinger variety, is a humanizer, its three segments—“International Stud”, “Fugue in a Nursery”, and “Widows and Children First!”—mapping not just the journey of its characters and the evolution of Mr. Fierstein as a writer, but also the human heart itself. The wants of its gay leading character are quaint: to have the kind of life his parents had, marriage, children, and all. It is an argument that gay people (breaking news) are people who want the same things as all people. But, “Torch Song” is also unsparingly queer, offering audiences—gay and straight alike—a portrait of gay life from the pen of one of America’s most important gay writers. Earning rave reviews (including mine) in its first incarnation, this production has rightfully returned to the Helen Hayes, as I predicted it might, for what I hope will be an extended run, despite its posted February closing date. In the transfer from Off-Broadway to Broadway, the performances have become better and richer—as is to be expected with time—but somehow the overall production feels more muted and a bit too comfortable on second viewing. 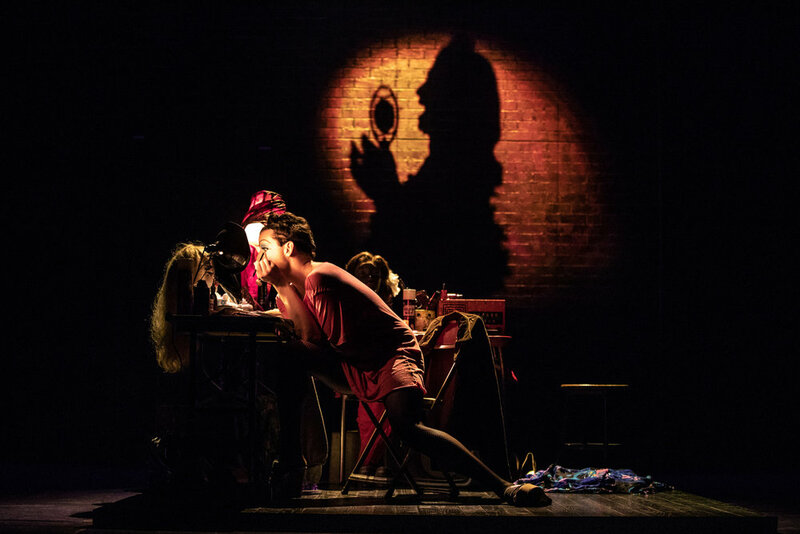 “Torch Song” is the story of neurotic and forlorn drag performer Arnold Beckoff (Michael Urie, “Ugly Betty”, “Buyer & Cellar”)—stage name: “Virginia Ham”—who is in search of love, family, and acceptance in 1970s New York. The play follows Arnold’s years-long, on-again off-again relationship with the sexually confused, All-American Ed (Ward Horton), and introduces Ed’s charming but clueless wife, Laurel (Roxanna Hope Radja), Arnold’s twinky young thing, Alan (Michael Hsu Rosen), a gay foster-kid, David (Jack DiFalco), and, of course, Arnold’s overbearing, unapproving mother, simply named Mrs. Beckoff (Mercedes Ruehl, “The Fisher King”, “Lost in Yonkers”). Mr. Urie is a consummate chameleon, a master clown, and a thoroughly engaging performer who I believe could skillfully play nearly any role handed to him. But weaker aspects of his casting that I overlooked Off-Broadway are only brought into higher relief on a second viewing. Partly, this is not his fault. The play was written by and for Harvey Fierstein to perform. It bears his unmistakable mark. And so no matter how hard he might try, Mr. Urie can only ever be a shadow—even if a remarkable one. The play’s iconic opening lines—“I think my biggest problem is being young and beautiful. It's my biggest problem because I've never been young and beautiful”—ring false because Mr. Urie is, in fact, both. The more global issue I took upon a second viewing, though, is that much like the ensemble in “The Boys in the Band” last summer, the gay characters in this production of “Torch Song” too often suffer for lack of authentic subtext undergirding their performances. Even as the backstage aesthetic of “International Stud” (the opening act) is appropriately gritty, Mr. Urie doesn’t quite convincingly evince the fear and desperation behind Arnold’s words; likewise, David’s jocular patina don’t seem to be masking the vulnerable, gay teenager underneath, and Ed is too often unphased by everything. These men, and Alan, too, feel too liberated for their milieu. I saw a full, unabridged production of “Torch Song Trilogy” at Washington, D.C.’s Studio Theatre in 2013, starring a then-unknown Brandon Uranowitz as Arnold, and from my memory alone, suspect that Mrs. Beckoff’s journey is regretfully given shorter shrift in this new version, which sees her flash from doting mother to flaming homophobe with whiplash speed. Mrs. Beckoff has always been a difficult character, but I wish Mrs. Ruehl was given more time on stage to allow the character to bloom as she should. After all, the interaction between Arnold and his mother is the most rewarding and electrifying portion of the play. All that said, a luxury of revisiting a touchstone text in a terrific production, of course, is being able to nitpick. This time, though, despite the nitpicking above, I sat back and just enjoyed Mr. Fierstein’s writing under the smooth hand of director Moisés Kaufman (“The Laramie Project”) and his cast. Striking and effective, as it was Off-Broadway, is David Zinn’s set design—aided by David Lander’s lighting—which becomes more complete and realistic as Arnold’s life comes into focus. It easy to take “Torch Song” for granted, to be blasé about what it means, but the big questions posed by this play are worth debating again. Who and how we define family, gender, sexuality, and identity become even more relevant as the LGBTQ community increasingly becomes part of the seen fabric of American life. “Torch Song” offers one view, of which are there are many, and importantly remains a play that is accessible for everyone to enjoy. That is the gift of so much of Mr. Fierstein’s writing over the years, and it is refreshing to encounter, especially in a political climate where stridency and purity on both the right and left are often valued more than compassion, empathy, and charity. In the end, Mr. Fierstein has crafted beautifully human characters whom you come to love, despite their frustrating flaws. I don’t know if Broadway in 2018 is where audiences go to have their minds changed or horizons expanded, but if there were ever a play that could do both, it’s “Torch Song”. Bottom Line: Following a hit run Off-Broadway last year, Harvey Fierstein’s landmark gay play “Torch Song” is back on Broadway with an abridged text and title, but its heart and humanity intact. On second viewing, this production feels more muted and a bit too comfortable, but the performances are richer and better, and the subject matter as timely as ever. An uproarious comedy with a suite of characters you come to love, “Torch Song” is a must-see of the fall (or any) season.